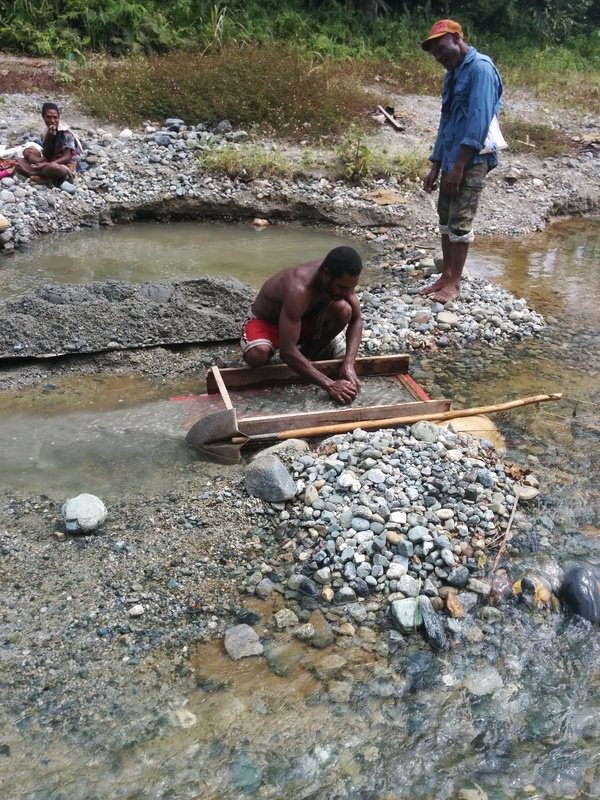 See Part One of Oke’s adventure gem hunting in Papua New Guinea here. Anyways – on to the gem hunting. We began immediately after dropping bags at the house, by visiting local villages. Each village consists of a family group or clan, usually up to around 100 people, perhaps a bit larger. Each village has an elected leader, and there is a respected hierarchy within each small village. At each visit, a group of people would gather around our vehicle, or in a small enclosure, and listen to me as if I was some sort of preacher. I would speak in English (all education is in English, so it is understood by many, particularly if spoken slowly and deliberately), and my host and my guard would supplement with translations to pidgin and local languages. (Most people speak at least one local language, Pidgin, and English.) I would pass around gemstone samples, and explain what people should be looking for, and the importance to put aside any transparent stones, particularly those that tended to be heavy, and ‘shiny’. I thought that keeping the message simple was the most prudent course. I would then be shown stones that the local villagers had collected. And shown stones, I was. My host and my guard had sowed the seeds by passing word around that a foreigner was coming around to look for stones. But this meant that people largely showed me random rocks. Many of the stones had fanciful stories, such as ‘I found this one inside the skull of a crocodile’, or ‘This stone was found in the belly of a bird’, or ‘This stone was found where lighting struck the ground’. Not everything I was shown was a stone. I saw countless marbles, pieces of glass that had tumbled in the river, at least three fishing weights, and a fishing bobber. I saw stones that had been spray-painted with gold spray paint, I was shown stones with obvious crude carving and scratching in them. 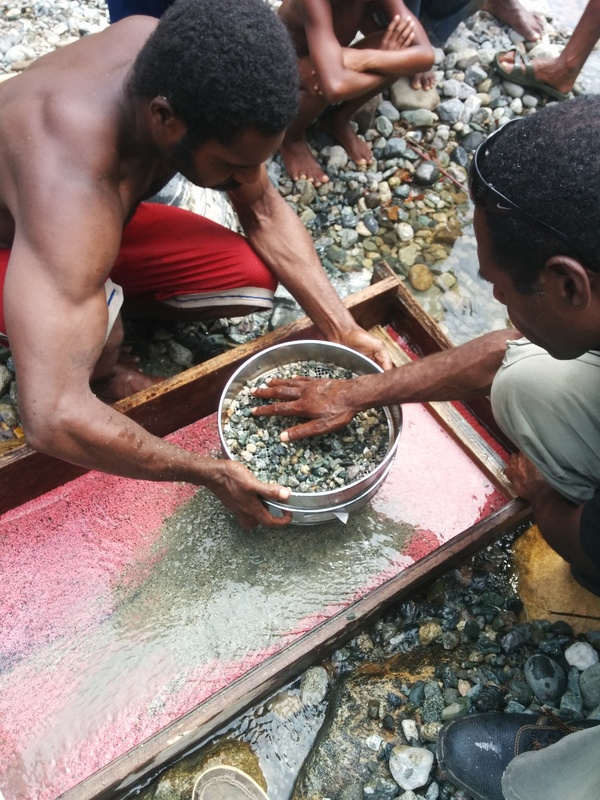 On a couple of occasions, I was shown stones that obviously had been bought overseas and brought to PNG – like those tumbled stones sold in airports. A quantity of flawless and clean quartz crystals, often with red iron surface stains. Most suitable as specimens, or very inexpensive facet rough. Lots of selenite & gypsum crystals, suitable possibly for specimens. Smoky quartz crystals, many of them flawless / very clean and suitable for faceting, in promising sizes. A quantity of assorted agates, jaspers, and river-tumbled quartzes. On two different river systems, garnets in a very pleasing but saturated red colour – clean enough to facet, but will be deep red, and will require some special faceting to make quality stones. Good sizes, including one nicely shaped specimen the size of a jawbreaker. Some epidote crystals, which would make for showy specimens, and if they can find larger crystals, possibly facet grade. Over the three days, I documented 27 different villages visited, and I estimate over 300 people with whom I spoke and did a little grassroots education about gems. In some locations, I introduced gemstone sieves, which they could use in addition to their crude sluice boxes, to trap larger pieces of gold, and to give them an opportunity to trap gemstones such as the garnets and other gem species identified. So while I am initially pleased with the specimens I gathered (I paid villagers a small amount of money for each specimen I kept with their agreement – usually 20 Kina, or $7-8) my long term plan is to return in 3-4 months, to see what else they have been able to find. 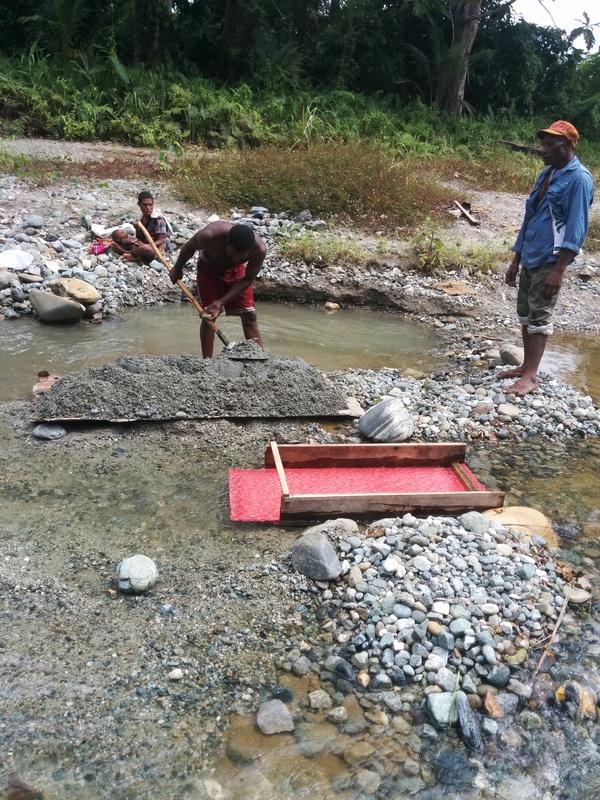 At the end of the day, since nearly everyone is doing a little mining or panning at some point of the year, they may as well be gathering all the rocks that may have some commercial value, even if relatively low value compared to gold. It was overall a very fun and productive trip, and a very enjoyable experience. I hope that my time left in PNG allows me to make similar trips in other regions, to see what I can turn up! Interested in Oke’s other PNG adventures? He’s written about living in PNG, how to buy a car there, trying out betel nut (ewww), and attending a Sing-Sing. I’m trying to research what gemstones are found in PNG for a novel that I’m writing – specifically hoping that sapphire is among them, even if fairly rare. Can you provide some information?